Kids love craft but, for many busy parents, the idea of setting up elaborate supplies, then cleaning up the mess that follows, can seem overwhelming. But when you can take your children out and about to do crafty, arty activities under someone else’s supervision? That’s brilliant! And for kids who want to extend their arts and craft skills and learn to do more complicated things than cutting and pasting at home with mum or dad, finding interesting arts and craft workshops for kids in Melbourne is a wonderful way to spend some time. While you’re perusing the exhibitions, your children can be gaining the skills that might just make them the next artistic success story. 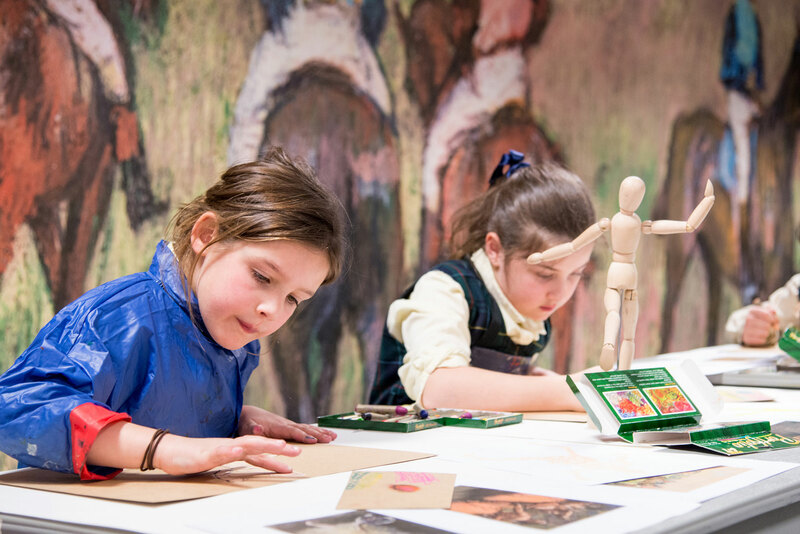 Over six sessions, young artists can explore the NGV collection and then get creative – inspiring them to get involved in some fun activities using a variety of media. The next round of classes (Term 2) starts from April 29 – June 3. Bookings are essential and places fill fast. Artplay is a CBD treasure that always holds something interesting for little ones who love extending their imaginations. From hands-on arts and craft-type workshops that might result in the making of an intricate puppet, to getting involved in something performance-related that uses a range of artistic mediums to help tell a story, this centre offers everything from free activities that are perfect for school holiday scheduling, or longer workshops that give your kids the chance to mingle with other like-minded kids and learn some impressive skills. The program changes each term and places do fill up fast – especially in the free activities. To find out what’s on for your child’s age group, visit the what’s on page of their website and plan your visit ASAP. Most sessions require booking in advance but some are drop-in only – and FREE! This centre has quality art classes for primary-aged children (aged 6-16 years old). Students choose their favourite medium and a project they’d love to pursue throughout the term ahead and they spend their time being mentored by an experienced art teacher, who helps them achieve their creative vision. Kids can work with a range of art mediums, including painting, drawing, printmaking, collage, sculpture and textiles. During school terms, weekly classes run Wednesdays and Thursdays after school (4pm-5.30pm) and Saturday mornings 10am-11.30am). A teen class runs from 5.30pm-7pm each Wednesday. Private classes and school holiday programs are also available. Encouraging creativity is a wonderful thing. This place does it in clever, colourful ways that are aimed at kids aged between 3-12 years of age. When your child leaves here with a hand-made masterpiece, they’ll feel proud and confident – and you’ll help them foster a love of creating things. 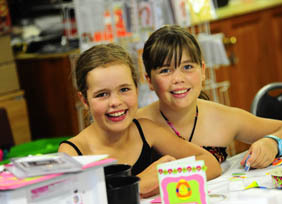 Craft parties and school holiday program events are all on the calendar. Mobile party birthday packages start at $10 per child. You might be capable of painting blank ceramic but can you glaze it for your kids? This studio has everything on-hand to help turn your child’s ceramic creations into shiny, durable works of art – and it can be practical too. When you walk in, it’s easy to be overwhelmed by choice – the shelves are stacked with everything from cups and plates and bowls to intriguing little ornaments – all made from pottery and all waiting for a splash of creative colour or artistic pattern to turn them into items your kids will be proud to display. To make a decision, let your self be driven by these two things: price and time. Basically, the bigger the item, the higher the price – and the more time it will take to decorate properly. So, if you’re looking for an easy way to while away an hour, grab a little knick-knack and let your child’s imagination go crazy, choosing colours to add. Or, if you’re happy to make a morning or afternoon of it, let them choose a large bowl or vase they can decorate in intricate style and be prepared to sit with them for hours as they get it right. This isn’t a drop-off centre. Parents or carers stay with the children and help supervise, and decorate too. Staff are helpful and can deliver the advice that gets your child closer to replicating a colour scheme or pattern they might have admired from one of the finished products that are showcased on the shelves. Once the painting’s all done, you leave the item there for a week or so and when you come back (make sure you hold on to your receipt to claim your goods! ), you’ll be the proud owners of a shiny, professionally glazed pottery item that’s ready to use or show off at home. You can drop-in (although bookings are always recommended), or book a birthday party with a group of friends for an activity that will keep all the party guests occupied – and give them a memento to take home after the celebration. With a lovely café just nearby, stocking up on coffee or your favourite juice is easy. The studio can accommodate up to 45 people for a large private booking or school group. If you’ve got a budding fashion designer in your household, bring them along to these classes – and give them a life skill that could take them far. Each school holidays, this friendly place has experienced and happy teachers taking 2-day programs that aim to help your child gain some quality sewing skills – and work on an individual sewing project. From crocheting for beginners to screenprinting and even sewing a kids’ cape – the classes on offer are always interesting and your child will come home with something they made themselves for a feel-good moment they’ll remember.